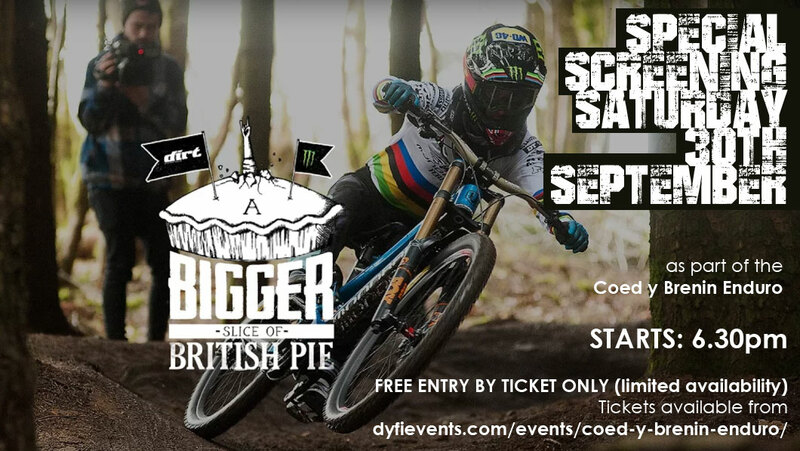 As part of the Trek Coed y Brenin Enduro on the Saturday ( 29th September 2017 ) of the Coed y Brenin Enduro we are pleased to announce that we will have a free film screening of UK MTB flick “A Bigger Slice of British Pie”. The film screening offers the opportunity for riders to relax, socialise and enjoy an appetising wedge of UK riding courtesy of our friends at Dirt Magazine. A Bigger Slice of British Pie provides a raucous celebration of UK mountain biking featuring our fine home grown talent and riders from around the globe, riding, racing and generally creating mayhem in this furious celebration of 2-wheeled madness. Tickets are free but the venue is limited to 80 capacity so ticket reservation is required. You can reserve your free tickets to the screening via our eventbrite entry page…. Beer, wine, soft drinks and snacks will be available to purchase.